All from America's #1 On-Demand Identification Dealer. We want to be YOUR Kroy Label Distributor, too! 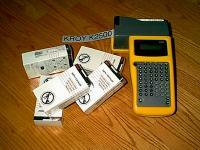 Click on the KROY Portable Label Printer for Details! 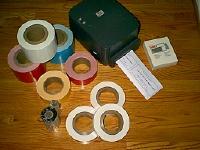 * We Repair Label Printers and also Buy Used Portable Kroy Printers! * We Sell Good Reconditioned Portable Kroy Printers, Wouldn't You Know It! Need a software upgrade or manual for your Kroy printer? printer model and serial number. Yes, we accept Visa, Amex, and MasterCard! Call, talk to Don Lovett or his assistant. Get straight answers, not canned cyber-talk. A larger cartridge purchase might entitle you to a more powerful Kroy machine. Contact us for confirmation. This page visited times since inception.